Well, compete they did and artists John Wynne and Tim Wainwright certainly didn’t disappoint. The exhibition is the result of their time spent with patients at the Royal Free and Harefield hospitals. As a fellow artist working within medicine, I understand all too well the complexities of gaining an insight into this fascinating world and the people, both doctors and patients, who work and are treated within it. 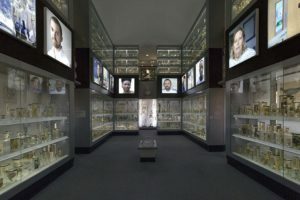 The magnificent Crystal Gallery shows sixteen light boxes containing portraits of said patients, who have been captured beautifully by Tim Wainwright; they caught my gaze in a challenging, questioning way and long held it as I looked up at them. These patients are strong, courageous people and this is evident within their portraits. Not only stunning visually, the work also fills the museum with sound and voice in an integral and accomplished way. John Wynne has utilised ‘transducers’, devices that transform the glass cabinets themselves into sound producing surfaces so that the installation is sensitive to, and blends well with the space. The portraits can be viewed from many different angles and different floors and is successful on all levels, offering unusual viewpoints. The double curved staircase which links the two main galleries features a video filmed during one of the patient participants’ thrice weekly dialysis sessions, illustrating what the person endures on a regular basis. 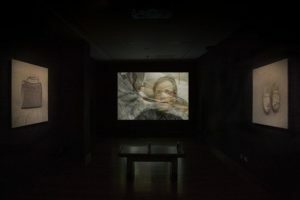 The Qvist Gallery has been turned into a black box; displayed in front of me is a video projection of still photographs, gently layered images, one fading into another, creating a surreal landscape of human beings discussing the patient experience from several different perspectives. Sounds emanate from the images on either side of me, one a handbag and the other a pair of bloodied theatre shoes. People from all walks of life and social standing, and sometimes their relations, discuss their experiences of receiving a new organ, highlighting the fact that a human being embodies so much more than their diagnosis. Each person has their own unique narrative, they exist as three dimensional and not just as the recipient of someone else’s organ. The people interviewed are in various stages of organ transplant – some have recently had the transplant, others are recollecting something that happened ten years ago, although it still influences the way they live. It appears that organ transplantation leaves a legacy of sorts, an experience that remains with you on life’s journey. Naturally it’s an emotive subject and I wonder if that is the side that these patients have presented to their doctors or that this insight has been revealed only to the artists who orchestrated it and created the space needed for them to talk from the heart about their experiences. They speak fondly of their donors, one individual naming her second child after the person who donated the organ that kept her alive. Amongst the staring faces we see briefly the beauty of the surgeon’s hands working on a part of someone’s anatomy to the sound of church organ music, adding drama to the scene – a graphic reminder of what these patients have endured. It is interesting to view how some people appear removed from the experience and talk about it from a very matter-of-fact medical viewpoint. This echoes my experience as an artist working with patients within an ENT department: sometimes the patient takes on the doctor’s language whilst they belong in the medical world. After watching one still image gradually fade into another, I was taken by surprise by the last image: a portrait that I initially thought was a still image until I noticed one of his shoulders rising and falling as he breathed. This exhibition is a poignant reminder that the objects contained within the glass jars of the Hunterian Museum are of human origin. What inspired you to embark on this work? JW: This project follows directly on from the first Transplant project Tim and I did nearly 10 years ago, when we were artists in residence at Harefield Hospital for a year. I’ve always been interested in medicine, having grown up in a ‘medical family’: my father was a doctor, my mother was a nurse, and my sister became a doctor. I was intrigued to explore the soundscape of the hospital environment, and I have a long-standing interest in the voice and with socially-engaged arts practice, so the idea of recording first-hand patient stories also appealed to me. I enjoy the challenge of creating circumstances in which people feel comfortable enough to share what is most important to them. I also enjoy the challenge of bringing my practice-based research into subject areas that are new to me: I start out, to paraphrase John Cage, not knowing what I’m doing – I know how to do that. For Transplant and Life, we revisited some of the heart and lung transplant recipients we worked with 10 years ago as well as working with abdominal transplant patients at the Royal Free for the first time. 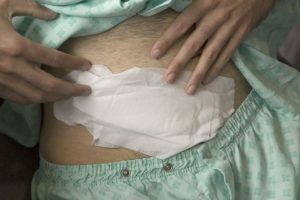 Getting such a long-term view of the transplant patient experience is rare, if not unique, and it was one of many motivating factors for Transplant and Life. TW: When I was doing the original ‘Transplant’ exhibition, I began thinking about the nature of the transformation experienced by the people I was meeting. They chose to pass through a process that took them close to death, but brought them back again into a new reality. Alongside the medical and physical elements, there was an experience of suffering and of renewal that seemed to have a spiritual dimension that was seldom recognised or discussed. Suffering, transformation and renewal is a narrative that we meet elsewhere. In some religious traditions, for example, there is a central story of how an experience of suffering leads to resurrection. In psychological treatment, people often pass through a process that they describe as the death of the old self and the making of a new one. So in part, this project for me is a way of examining how organ transplantation can lead to the possibility of new life, rather than prolonging or resuscitating an old life. Listening to their stories, it seems to me that people pass through suffering and emerge transformed. Who was the work made for? JW: We hoped that the project would make the life, death and identity issues raised by organ transplantation accessible to a broad audience. More specifically, the idea was to bring the patient voice and experience into the medical museum. The Hunterian has a massive footfall – they predicted nearly 50,000 visitors during our exhibition, so of course we hoped that at least some of those who came to see the collection would engage with the experiences, thoughts and emotions conveyed by our participants. But we also made the work for the patients themselves, their families, and for others who may be going through similar experiences. When one patient at Harefield heard some of the recordings we put online, they commented that “I wish someone had told me some of this before I had my transplant.” That comment has always stuck with me, and I hope our work is of benefit to patients and their families, who don’t often have the opportunity to learn about the experiences of others. Who has been your audience for this exhibition? So, I hope other clinicians and medical professionals take time to engage with our work and that it has a positive effect on the way they work with patients. I’m also interested in engaging audiences who may not have experienced much artwork that deals with medical subjects, people who come to it because they’re interested in sound art or installation or photography but perhaps hadn’t thought about what a sound artist might do in a hospital. TW: From school kids to surgeons. How will you use this experience and move on to your next body of work? JW: I’m just starting on a project on noise, sound and sleep in hospitals for which we have received some seed funding from the King’s Cultural Institute. I’m working with a Professor of Nursing from King’s, an engineer from Imperial, a colleague from the University of the Arts London, and a couple of technology companies. The project aims to contribute to the holistic understanding of sound in the hospital environment and the intimate relationship of noise to sleep, rest, treatment and recovery. We hope to raise awareness of the issues around noise amongst nursing, medical and other hospital staff and also to explore creative and practical solutions that will contribute to patient wellbeing and potentially improve recovery times. TW: I’m already making a new body of work and I’m really enjoying showing it away from the museum and gallery context. So, I guess the experience I use from this is to think very carefully about why and where I want to show my work. For those interested in gaining an insight into the thoughts and feelings of being in the patient’s chair, their story and that of their friends and family, I would encourage you to go, see this and be inspired. But hurry; the exhibition ends on May 20th! It’s also your last chance to view the Hunterian Museum before it closes for three years for refurbishment.